In order to use these forms, you need to be a resident of Santa Fe, Rio Arriba or Los Alamos County and be at least 14 years of age. After you complete the Petition, file the form with the District Court Clerk. The Petition needs notarized and the filing fee is $132.00. After you file the form, the Clerk will notify the judge of the case. After filing the Petition, go to the judge’s office and ask for a Hearing around 30 days in the future. Notice is also required in a local newspaper. Travel to a local newspaper in your county and ask for publication of the Notice once a week for at least two consecutive works. You will have to pay for the publication costs in the newspaper. These fees can be over $100.00. After the Notice has been published for two consecutive weeks, the newspaper will send the petitioner a Proof of Publication. 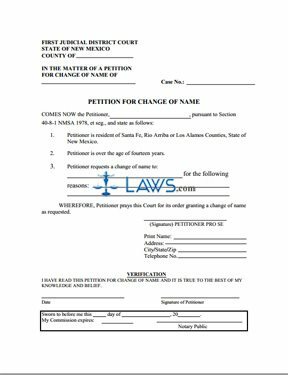 The petitioner needs to file this form with the Court Clerk before the hearing. Make sure to bring a copy of the Proof of Publication to the Hearing as well. Attend the hearing and tell the judge why you want to change your name. If there are no objections to the name change the judge will sign the Order. Bring the signed Order back to the Court Clerk and file the original form. Make sure you ask for certified copies of the Order. The certified copies will cost $1.50 per page, and you should obtain several copies because you will need to change multiple records. Make sure you record the Order with the County Clerk. The recording fee is $7.00 for the first page and every additional page will cost $2.00. If you can’t pay the filing fees, you can ask the judge to waive or reduce the fees. You’ll be informed of the form you need if the judge approves a reduction in fees.